You know how it goes. You think you're doing plenty. And then you realise that you haven't been drawing in ages. And it shows. And then you understand why you've been feeling. What? Off your game? Flat? Not right? And you wonder how it happened. Yes, life is busy. Bills have to be paid. (Just got our Laya health insurance bill, by the way, and couldn't believe how expensive it was. I must ring them on Monday and discuss plans.) Laundry has to be done. Dog has to be walked. Cat has to be injected. (And his litter tray has to be cleaned up - constantly - despite the regular insulin routine, he still drinks too much, and pees day and night. ) But drawing for 15 minutes a day should be possible. A matter of time management? Priorities? And where to fit yoga and meditation then? Doesn't even look like me! And proportions are all over the place. Thankfully, does look like my cat! 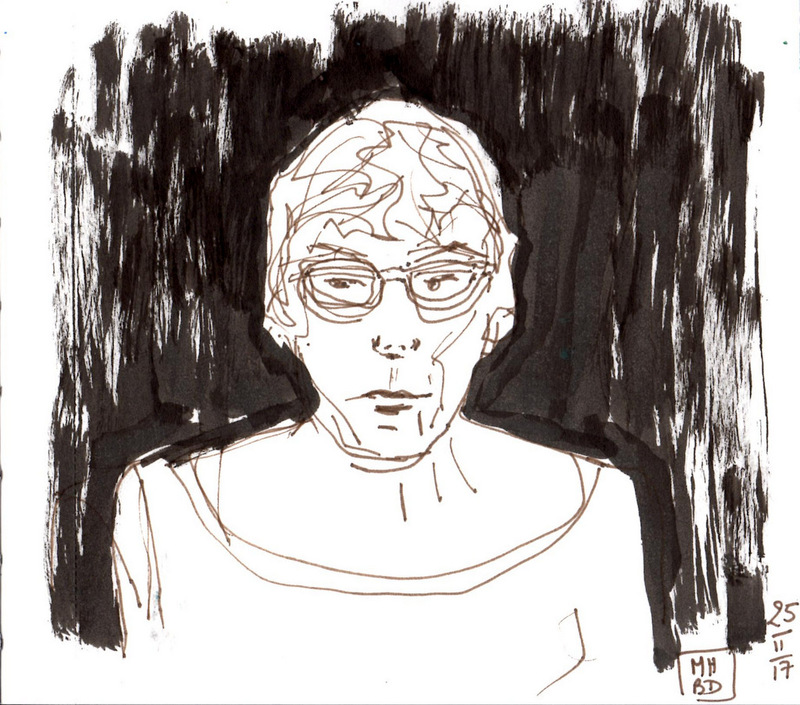 The only solution of course is to pick up a pen and a sketchbook and draw what's there. The cat. Me. The dog (if he didn't move so much). And pick myself up, one drawing at a time. Be warned. Some of these are not very good. And some are absolutely awful! Interestingly enough, there is actually a resemblance here. A completely generic face. Must try harder. This is a building that I've been longing to sketch for a good while now. But the old wing of the National Gallery of Ireland was behind scaffolding and closed to the public for a few years and it only reopened in the summer (I sketched a little section of the façade then). And I really didn't have the skills to tackle that simple but complicated façade. Last Sunday, I was actually going to go inside, as it was cold and a bit drizzly. But as I walked in, a security guard stopped me and told me that my backpack and "this item" would have to be left at the cloakroom. Well, yeah. I don't travel light. But I find a backpack easier on my body than a shoulder bag. And the item in question was just my three-legged stool, neatly wrapped in its little sleeve and carried over my shoulder. Did he think it was a gun? Or simply that I could damage valuable paintings just out of clumsiness? The latter is more likely in my case, it has to be said. So, I decided to stay outside. The rain soon stopped. I was well wrapped up. And I got engrossed in my sketching. The said security guard did feel bad, by the way (I think so anyway!). He brought me a sketching stool about ten minutes later. The guards in the National Gallery are very nice! 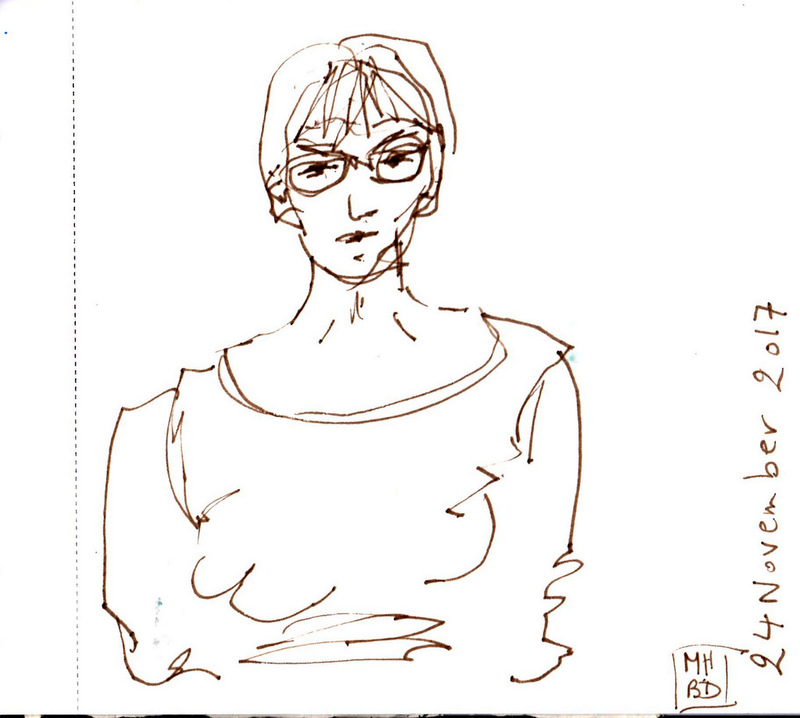 But anyway, that's how I was still sketching outside in mid-November! So I felt a real sense of achievement when I actually managed to sketch the whole building! Thank you Security Guard for not letting me in. 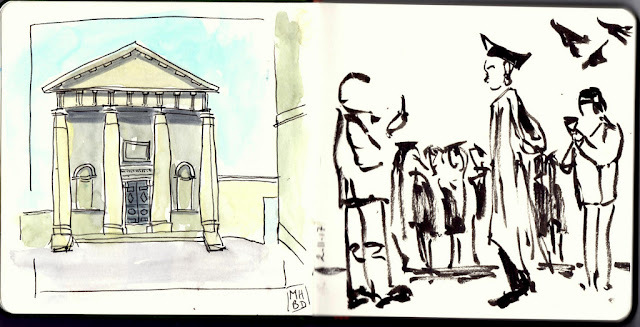 And Thank you Liz Steel for a wonderful SketchingNowBuildings course, which is really helping me on my journey! 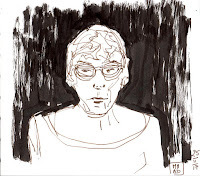 I am not yet able to sketch at the speed I would like. But I am finally achieving a better sense of proportions in my architectural sketches. I'm not there yet, but I feel I am making progress! And not only that, but I did manage to fit the full building on the page! Something that you may remember is not my strong suit. I still have a lot to learn, even at this level. 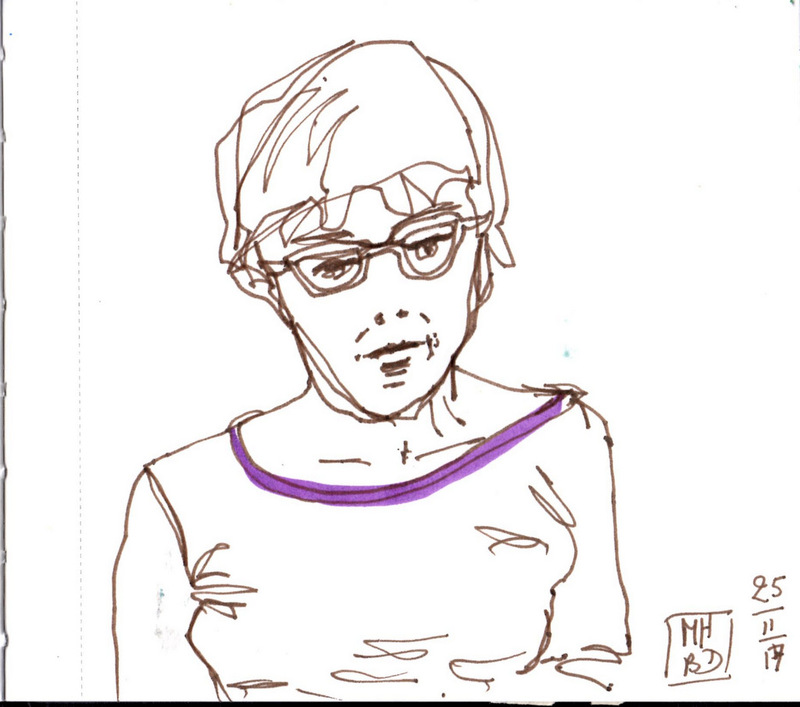 But in my mind, my goals are 1. to sketch looser (but still accurate!) and 2. add people. So it's going to be a long journey! This is the finished sketch - an extra half hour at home was all I needed to finish the details and add more colour and shading. This is how far I got on the day - about an hour and a half of sketching time. How to explore painting shade and cast shadow on a cold grey day in November? And finding a good-looking modern building in Ireland? Well, I took the lazy option and sat at my dining room table. I've always found our ceiling interesting. Although this sketch makes it look like there is significant damp in the corners. Not the case. We got a new roof a couple of years back exactly for that reason. And now, it's completely dry, even on days when it doesn't stop raining. PS: If anybody has any ideas of an interesting modern building in Dublin that I could sketch, let me know! This is the last of the indoor exercises I had to do. In this version, instead of giving the buildings a first light wash, I started with the shady sides of the houses first, leaving the sunny sides white until I was done with the dark side. The one mistake I've made throughout, I now realise a bit late, is that the shady side doesn't have strong cast shadows. Hopefully I will remember this in future! The big advantage of this technique is that you don't have to wait for the first layer to dry. Although I did struggle with paint bleeding into damp areas at various stages all the same. I think my light sides are a bit too light, but that's probably better than being too dark. Now, I need to find a modern building and a sunny day to do my outdoor assignment. Now that everybody else seems to be finished this course, I am struggling a bit with motivation and I have become slow with my assignments. I really want to finish before Christmas, though, so I'll have to stick at it. I was looking forward to this section on mapping light and dark (or dark and light?). I found the value study exercises really good, learning how to differentiate between form shadow (or the shady side of a building - it can contain a lot of reflected light) and cast shadow (which is often a lot darker, and cooler colour), and also discovering that the bright side of a building is often more bleached out than you'd think - although that probably applies to Australia and Italy. But not so sure how that works out in Ireland. As I will be doing my outdoor assignment here in Ireland over the next couple of weeks, the darkest dullest time of the year, it will be interesting to see how that works out for me! But I've just realised I still have to do a second indoor colour study before I'm allowed outdoors! So I'll continue pretending I'm somewhere warm! I got very frustrated when I was trying to finish this painting, but I think I'm done. It needed a darker bit in the middle to separate the two rock formations, but the paint I applied initially was too dark and heavy. So I had to lift it (magic eraser to the rescue) and tidy it all up. There was a point where I genuinely thought I had ruined it. But it all worked out in the end! My desk is currently taken over with a big acrylics canvas and paints. It's a bit of a mess. And I'm dithering between figurative and abstract. But the main difficulty with it is that I have no room left for watercolour painting - I need a bigger room. Or another tidy-up. And more time. I've got a couple of watercolours on the go, and I really want to finish them, but I keep finding excuses. And in less than a month, I'll have to have the guest bedroom clear, which means tidying my office and my art-room so I can move things from the guest bedroom into these two small rooms. Busy Busy weeks ahead! Busy busy mind is not good for creativity. Still, I can't complain. I do manage to fit in a good bit in the time I have. So this one is going remarkably well, considering the lack of physical and mental space! If you remember I painted a view of the Healy Pass on the Beara Peninsula soon after being there at the end of the summer. I was thinking of exploring the same technique further, but my attempts at watercolouring with a knife were not as exciting as that first painting. So I've gone back to more traditional watercolour techniques: a light wet-in-wet layer, followed by darker and darker layers, with each stroke pulled with a thirsty brush to soften the edges. I need to balance both sides a bit, but I'm getting there. Interesting that I was really relaxed while painting this, and I think it shows. Also, it's one of my favourite papers - Hannemühle Cornwall - a very strong texture - it handles the paint beautifully. I must get myself some more of it, as I'm running low! This one got too dark and messy. I might lift the paint in the grass centre and have another go, but I think the joy is gone out of it. I might just wash it off and start from scratch. This one was done on a little square of paper that clearly is not suited for dragging paint, even with an old credit card - the fibre lifted. I haven't yet found what that paper is good for! A few adjustments, and I'm done. That's it. I've seen enough of this painting. And yes, I abandoned the other version. For some reason, I'm very slow painting this year. Next painting, I want to keep all my whites and lights with masking fluid and paint with abandon. I hate recovering the lights. Although I have to admit that the magic watercolour eraser is very handy. I'm not 100% sure yet, which probably means I need to do something. But what? Right now, I'm leaning towards adding some more leaves to that central tree - it looks like it needs a bit more leaves on top. It's a bit stumpy, isn't it? In the end, it will be about finding a balance between light and dark. And not letting my haste to be done with it ruin it all! I'm running behind, as always at this time of year - lots of things to do. Not much time to document everything. I was delighted when The Magic Flute was announced for the Met HD programme, as I had never seen it before, and I had heard a lot about the magical production by Julie Taymor, who directed The Lion King, a show that's been running nightly since 1997 on Broadway! I've never seen The Lion King (the original 1994 Disney animated movie, nor the musical). And I loved The Magic Flute, despite reports of sexism by a friend who saw the Covent Garden production. Yes, Mozart is not exactly a feminist. But hey, it was sung in German, so I could ignore the subtitles if I found them too offensive (a major element of the plot has got to do with the hero having to ignore his beloved's pleas, as "women are the cause of a lot of trouble for men", or words to that effect). Beautiful singing. Beautiful production. And the Queen of the Night is such a great baddie. Unfortunately, the Odeon in Stillorgan cut the ending before the opera was actually finished. A lot of angry punters. Apparently, the transmission ran late and they cut it off automatically because they had another movie in that theatre. Annoying, yes. But not the end of the world. The clips below are from the English language version. What I bought with my voucher! In case you're bored with my goings-on about pigments and watercolour papers, here is a little diversion! Remember I won the prize for the Nation Paints on RTE, the mini-competition accompanying Painting the Nation (which was won by Hazel Higgins, a young Sligo woman, who was a student of my good friend Máire Hynes, a ledge of an art teacher, according to her student ratings on RateMyTeacher.ie, by the way!)? Well, that One4All voucher has been burning a hole in my pocket since I received it. Since the main art stores in Dublin are not covered by the voucher, I had to have a think about what to do with it? Grocery shopping in SuperValu? Pet supplies for my four-legged friends? Make-up from Boots? A spa day? A weekend away? A nice meal out? Difficult choices. Most of all, I wanted to get lots of things, not just one big thing. And what do I do when I want value for money? I tried 10 different tops and knitwear and I narrowed it down to three items. With still plenty of money on the voucher, I headed to Schuh and got myself a pair of Sketchers pumps. Then to Fat Face where I bought a gorgeous teal top. And I still have over €75 left on the voucher! This always happens to me. I read a book. And I don't write about it straight away. And by the time I get to my keyboard, I've forgotten what made this book special to me. I actually read this one before the summer. 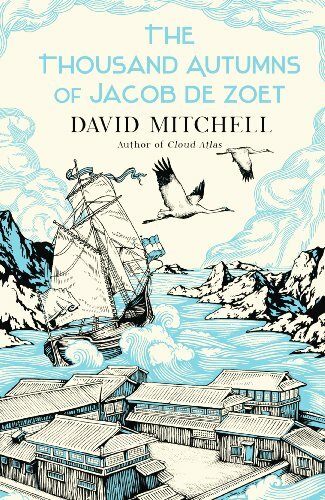 Well, first of all, The Thousand Autumns of Jacob de Zoet was written by David Mitchell, of Cloud Atlas, and The Bone Clocks fame. Second, it's set in Japan. It's very different in style from the other two books, presented more like historical fiction, which it isn't. All the characters and stories are fictional, but apparently the author did quite a bit of research so that the details are historically accurate. I quite liked the storyline, it's actually more of a thriller. But of the three books, I think The Bone Clocks is my favourite. Or Cloud Atlas? I can't decide! 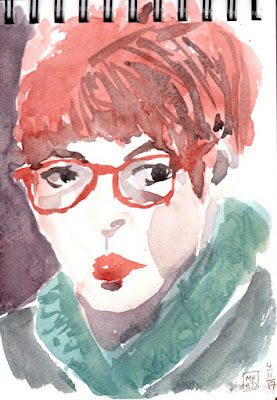 Another cold day at Dublin Sketchers last Sunday. I wore the same elegant outfit as the previous week. And I was cosy. The more I sketch outdoors, the more I'm determined to stay sketching outdoors into the winter for as long as I can. I may be glad of the indoors next week, or there might be a rainy day and I'll have no option. Or I'll become a really hardy urban sketcher! It's a bit like some men that I know that take pride in wearing shorts into the autumn (BB lasted until the end of October last year, but didn't do quite as well this year - it just wasn't that kind of a summer. There is a man in the park who's still wearing shorts - nearly mid-November - a record maybe, but not a great fashion statement). Or maybe it's the excitement and enthusiasm brought about by the fact that Dublin Sketchers is now a Chapter of Urban Sketchers! Or, more probably, it's that I'm making my way through SketchingNowBuildings and I want to put into practise my newly-acquired skills. The location chosen for the Dublin Sketchers outing was Connolly Station (check out the link for two interesting facts about Connolly Station!). But it was too hectic for me and my Moleskine (I'm using the A4 landscape one). So I walked around the back. Not via Sheriff Street, which I still consider too rough a street for casually strolling or sketching. But Harbourmaster Street, at the back of the IFSC - completely quiet on a Sunday afternoon. Probably humming with banking and finance professionals from Monday to Friday. I chose a little spot behind a Michie Sushi restaurant (open 7am-9pm Monday to Friday, closed Saturdays and Sundays - Ireland has finally embraced sushi), facing George's Dock. And I set to work. The sun was shining across the Liffey (which I couldn't see), and I was fascinated by the space in the skyline between a little church across the river and the ultra-modern IFSC building. And I developed the sketch from there. After an hour and a bit, I had my pencil sketch done. No ink. No watercolour. But it was time to go in and warm up. A camomile tea and a slice of carrot cake later (thank you, Parlor Café, North Star Hotel), I was ready to add colour. The picture below shows how far I got on location. I was going to call this one Water and Fire, or Earth Wind and Fire. But neither sounded right. The inspiration is all hissing lava and bubbling water. And now that I think of it, a fairly common theme in my abstract acrylics. I am 31 years in Ireland, and one thing that I have only recently noticed is that hedges are very popular in suburbia here. Looking at works from urban sketchers around the world, and from my own experience in Belgium until my early twenties (and now you know my age), it seems to me that people in other countries like to show their houses to the world, whether it is to display their wealth or to let in the light, I don't know. In Ireland, well, in South Dublin anyway, houses are often hidden away behind high hedges. I believe there are bylaws that prevent the erection of high walls in front of houses, so we have a combination of low walls and high hedges and trees instead. Are the Irish more private than their European counterparts? Is there a similar trend in the UK? I don't know. All I know it that low walls and hedges are very hard to sketch in terms of perspective! Another thing of course are the electricity cables - in more central areas, they are all underground. And probably in newer neighbourhoods too. But I love the criss-crossing of those cables! Another thing I love about Japan too, actually, those electric cables - they are everywhere, in cities and towns. A friend of mine thought they looked ugly, but I like them. 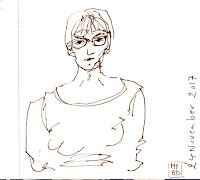 I've only sketched them once - I'm not fast enough of a travel sketcher to make time for good sketches when on holiday with my husband. He's very patient, but half an hour is not enough for me (on that occasion, he was buying a knife, so I left him inside the shop and sketched outside). And did you know why Japan, a modern country, doesn't bury its electric cables underground? Because of the earthquakes. Much easier to find and repair the faults when the cables are above ground! It was a cold afternoon. By Irish standards, that is. Not sub-zero celcius, but the wind-chill was definitely pulling the temperature down. But I came prepared - thermal underwear top to bottom, a long puffa coat, good socks, heavy boots, a scarf, a wooly hat, and my mittens. No prize for elegance. But it was worth it. It was a beautiful dry sunny day, and I didn't want to be stuck indoors. Still, after about an hour and a half, I had to go in and warm up. At that stage, I had finished my drawing, and all I needed to do was to add colour. And to drink a hot chocolate. Ely Place Upper is a very central location, right in the heart of the city, a stone's throw from St Stephen's Green, the Shelbourne Hotel, Merrion Square. The location had been chosen for an exhibition showing at the RHA last weekend, but I had gone in to town on the Saturday to look at the exhibition. I wanted to have all my time for sketching. The whole time I was sketching, there were cars doing three-point turns right in front of me - people hoping to find a parking space at the end of the cul-de-sac. I gave them all a big smile (especially for fellow sketchers!). There was a car parked in front of the house itself, so I had to kind of guess how the steps and railings met the pavement. I find cars harder to draw than buildings - all these curves and subtle changes in plane... another day's work. 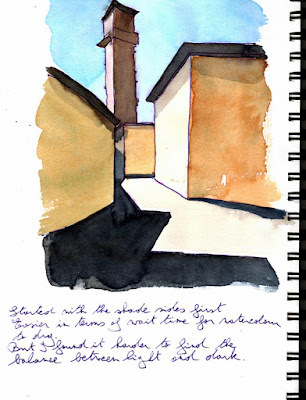 I followed the "structured" approach taught by Liz Steel in her Sketching Now Buildings online course. Without it, I would never have felt confident enough to draw this. I need to continue to practise, though! This is how the sketch looked after my first pass with pencil. Not much to look at, but I spent a good bit of time figuring out the general shape and proportions, and the placement of the windows. I found it interesting to see that the door and the ground-floor window are not aligned with the upstairs windows. And that the windows get smaller and smaller as you go up the stairs. It took me a good while to work every shape and detail with ink. I'm very fond of the little balconies at the first-floor windows. The door is my weakest element. Next time, I'll pick a Georgian house with a no-parking sign in front of it, so I can have a closer look. As I was getting frustrated with my attempts at abstract with watercolours, I decided to try the same basic idea in acrylics - knife painting and spraying water on the wet paint. Lots of yummy colours. Much happier with the results, particularly after I applied a gloss varnish on top so the darks really pop. These are fairly small canvases (about 25 cm in height), so easy to manage. I'm currently trying something on a bigger size, and let's just say that I'm glad I put a dry-cleaners' plastic cover on my worktop before I set to work. 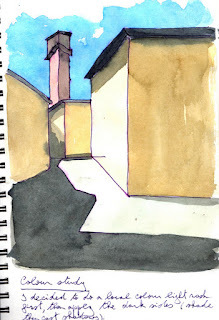 One of my goals for this year is to move towards a more abstract approach to my watercolours. Quite a struggle right now if you want my opinion. But it's my goal, so I can't moan! I want to use a palette knife more to move the paint around. But I'm discovering that this is something that's even more sensitive to paper quality and thickness of the mix than painting with a brush. So here I used a palette knife to apply the paint, and then I sprayed water over the top and moved the paper up and down to make the pigments move. I chose Daniel Smith granular pigments for this. The Lavender worked particularly well for the hazy effect. My darks are a touch too dark I think (mostly Bloodstone Genuine, some Perylene Maroon). But still, a good start. Similar technique here, but I went too heavy on the darks I think. And didn't leave enough of the white paper to counterbalance. I might spray all over to reactivate the paint and see what happens! 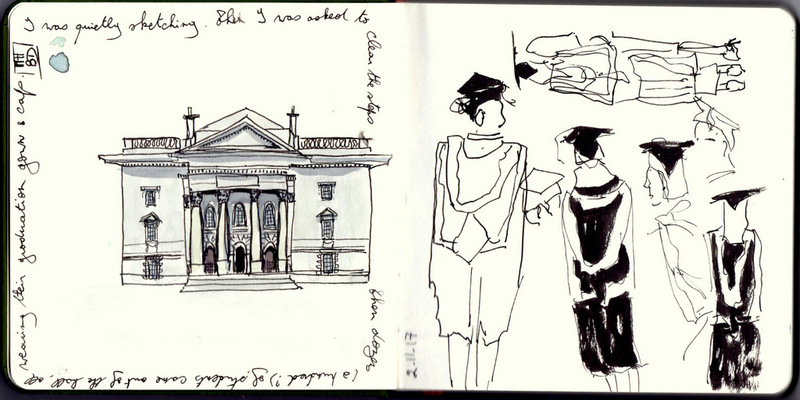 I was sketching around Trinity College not long ago. I was practising "working structurally", a technique from SketchingNow Buildings, an online course by Liz Steel, which I'm finding very useful as I want to sketch more complex scenes these days and need to develop my observational skills, as well as a sound method for approaching intimidating classical buildings. This time, I worked in a small square sketchbook, as I had a sore back and I didn't want to be carrying lots of art supplies with me. 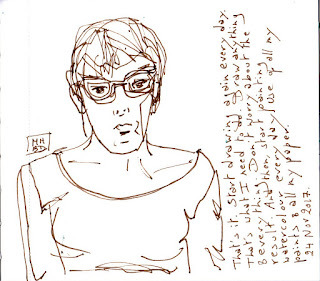 I am not a delicate draughtsperson, so changing to a different sketchbook presented its challenges for me. Plus, I didn't have much time. And we all know what happens when I rush. But Trinity College is such a wonderful place - it has both ancient and modern architecture, lots of steps to sit on, and a constant lively crowd pacing its squares, students and tourists alike! And a few quiet corners too. And cricket matches when the weather is good! 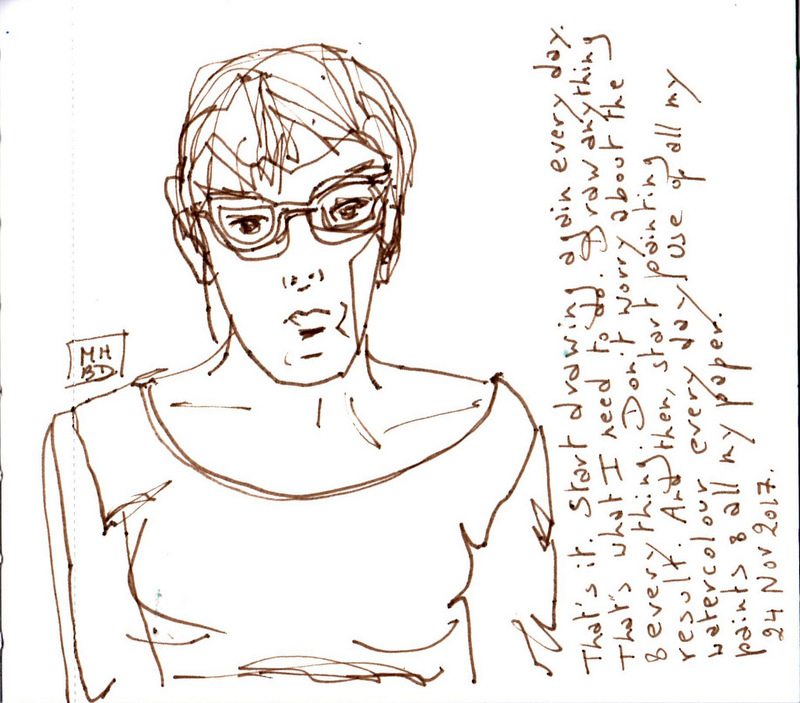 For this sketch, I was sitting on the steps across from the Examination Hall on Parliament Square. All was quiet and peaceful, until a security guard asked everyone to clear the steps. I thought there might be a wedding in the chapel behind me. But a few minutes later, the commencement procession crossed the square to reach the Trinity College Chapel, with all the pump and ceremony expected for the occasion. Graduation Day! Or Commencement in Trinity parlance. At this stage, I was standing behind a bin, still trying to finish my sketch. 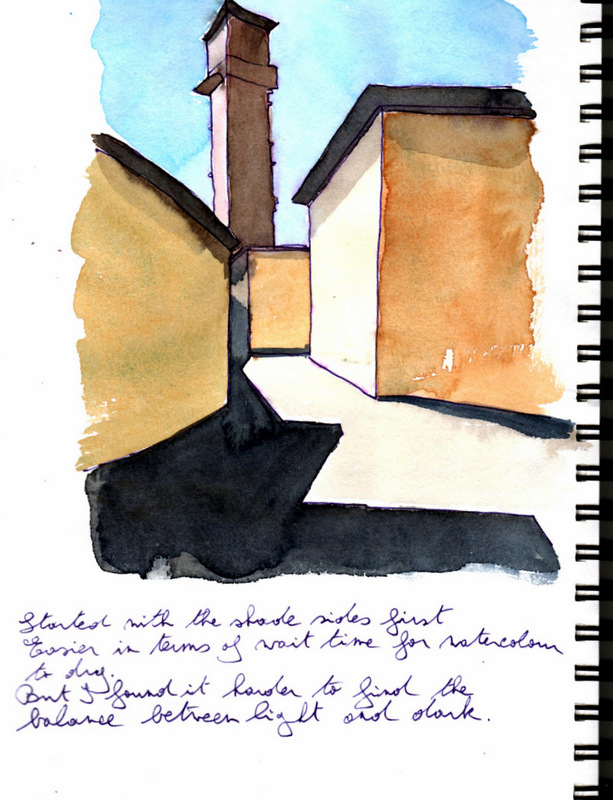 Actually, those solar-panelled bins are very handy - a good flat surface for my sketchbook! Must remember that! When I could no longer see the Examination Hall, I started sketching the new graduates, in their beautiful black gowns trimmed with cream (fake?) fur. I then decided to move to a quieter spot. I'm not sure what it's called. There was no name on the building (that I could see anyway). It just looked like an ancient Greek temple. It's beyond Library Square, on the Pearse Street side. After struggling with pillars, I moved back to Parliament Square and sketched proud fathers taking pictures of their offspring! And the black things in the air are not crows. They are the black square hats that are thrown in the air after graduation. All of this ritual is alien to me. We didn't have any formal graduation in my college. It was all very low key. Just exams, passed. A thesis, passed. (First class honours - I was a good student) And less than a week later, I had moved to Ireland anyway! And here, I couldn't resist throwing in a few pictures of the Long Room. Wouldn't it be wonderful, and scary, to sketch in there some day? You may have noticed that my Google account picture has changed. I thought it was time to remove old Odile and replace her by a more flattering view! I'm struggling a bit with my urban sketching at the moment - I'm doing a very good online course about sketching buildings. I'm learning a lot. But what I'm gaining in accuracy, I'm losing in spontaneity. That's a normal stage in learning a new skill, but I'm finding it hard all the same. What I should do of course is practise more. But it seems I'm choosing avoidance instead! Hence these two quick self-portraits in watercolour. Not brilliant, but at least I have the excuse that I have never done any portraiture training! My favourite yoga studio - all three teachers are brilliant! Danu Yoga Centre video from Lisa Burke on Vimeo. It was noisy, it was cold, it was busy with lots and lots of children, but what fun! Last Sunday, we (Dublin Sketchers) sketched at Stokerland, in St Patrick's Park. Lots of noise (I said that already - but imagine the bells of the cathedral ringing non-stop + music from a kiddie disco + strange sounds coming out of a machine + children running an screaming). Lots of adults and children in great costumes (have you ever seen a two-year old with a Dracula cape? - the cutest thing ever!). Lots of attractions - a man on stilts, old-style swings, face painting, a helterskelter - (I didn't know what it was until last Sunday, except for the Beatles song), and, my favourite, Morbid & Sons singing about the grave (and dying) business of undertaking! It was hard to find a spot to capture it all, but once I was happy with the view, I set to work with abandon. I was also available for chats with children and grown-ups who dropped by to have a look at what I was doing! OK, one day late, here is my Halloween sketch! I was given the cutest little pumpkin (or is it a gourd?). So I had to sketch it. Not very successfully, I admit. The first looks like a grapefruit. The second, more like a scone. I'm busy with a couple other projects, so maybe I didn't give it the attention it deserves. It was fun, though. Maybe I'll have another go. Is it edible, I wonder?